Assemble your Fruit Head Guy as creatively as possible. Use the grapefruit as your base (head). Dried apples can serve as the eye socket with raisins as the eyes, papaya can be the nose. Fruit roll ups can be the hair. Use toothpicks to secure the fruit to the head. 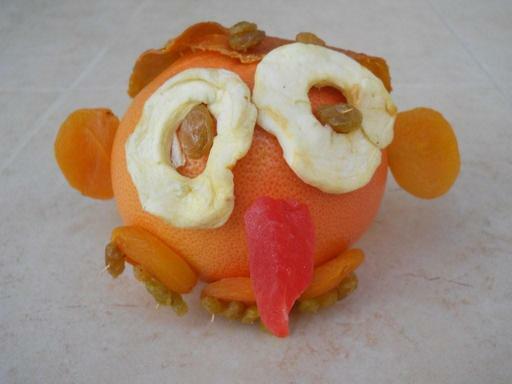 Fruit Head Guy makes an excellent appetizer on Tu B’Shvat.